What makes one facial $80 and another three times the price? The fact is that the costly treatments often go way beyond the basic cleanse-tone-moisturise regime. There are body treatments that claim to go beyond the surface treatments that profess to reduce cellulite and rebalance the nervous system, or conducted with special techniques like a proprietary massage that promises firmer skin. The procedure: Your half-day of pampering begins with a Welcome Foot Ritual followed by a Floral Bath and Steam. Next up is the Salt & Oils Scrub that exfoliates the skin as preparation for the Detoxifying Algae Wrap. After this, you’re ready for the signature Oriental Massage. The Aromatherapy or Rebalancing Facial ends the session with a relaxing head massage. Justifying the cost: It’s cheaper as a package. The breakdown: The Welcome Foot Ritual is $110; the body and skin enhancing Salt & Oils Scrub is $70; the Detoxifying Algae Wrap ($175) provides algae rich in minerals and enzymes to boost metabolism while speeding up the elimination of toxins; the Oriental Massage ($180) combines the best of all massages in this spa blending the techniques of Thai and Asian to sooth the body; the deep-cleansing Aromatherapy or Rebalancing Facial each costs $150. The procedure: Start with a Vichy Shower followed by an aromatherapy body booster with a Green Papaya Clay Body Mask. Next, enjoy a relaxing Aromatherapy Massage before you break for a light and healthy two-course lunch for an hour. Return after lunch to an Aromatherapy Facial and a Spa Pedicure for top-to-toe indulgence. Justifying the cost: The 30-minute Vichy Shower is an aqua-therapy that costs $75; the Green Papaya Clay Mask ($115) is a full hour’s session that makes use of the rejuvenating properties of papaya to promote skin cell growth with rich enzymes; the soothing 90-minute Aromatherapy Massage ($165) consists of intensive spinal pressures to rebalance the nervous system and promotes deep healing in various parts of the body; the 60-minute Aromatherapy Facial costs $125; the Spa Pedicure ($115) is another hour’s session of mineral salt scrub with nail and cuticle grooming, a peppermint mask and a soothing massage on the reflex points, finishing off with a coat of nail varnish. The entire course of treatments take place in the relaxing garden atmosphere of a private outdoor pavilion. The procedure: This four-step programme begins with a seaweed scrub and a creamy mask, and goes on to the patented Gyra-Massage Technique (GMT), which is a weight-loss and anti-ageing treatment. 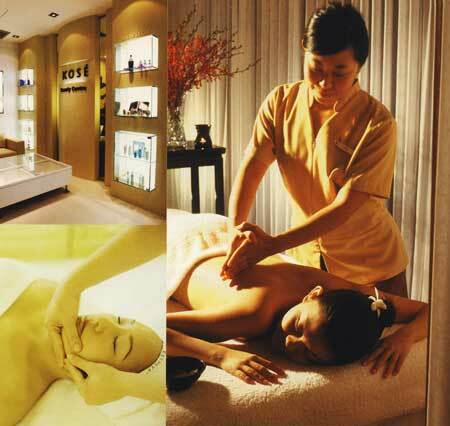 A seaweed body wrap and an aromatic body rub end the intensive program. Justifying the cost: The seaweed scrub is a nutrient-rich blend with peeling ingredients for exfoliation and circulation stimulation; the creamy mask is tailor-made for your skin type for a smooth, effective result; the Gyra-Massage Technique helps to re-contour the body, reduce cellulite and even treat stretch marks and post-natal scars. It flushes toxins out and restores a firm tone to the skin; the wrap contains deep-sea nutrients to detoxify and oxygenate the body, and reduce fatty deposits; the aromatic body rub provides the firming and lifting finale. The procedure: Together with the spa’s signature Face-GyMTM massage, this treatment uses marine DNA and individual ampoules of the vitamins A, C and E to detoxify, nourish, hydrate and energise skin from chest upwards. Justifying the cost: The FaceGYMTM massage is an exclusive method that requires a specially trained therapist to stimulate all your facial muscles with a unique firming technique and utilises the concentrates of vitamins A, C and E. The marine DNA mask is a deep moisturising and anti-oxidising mask that is anti-wrinkle and nourishing. It helps skin produce natural collagen and elastin fibres for more suppleness. Vitamins strengthen skin, improve its synthesis of micro proteins and collagen for suppleness, and prevents skin damage while lightening scars. Immediate radiance is promised. The procedure: This anti-ageing treatment moisturises and firms both face and neck, imparting an incredible smoothness and suppleness. Aromatherapy promotes relaxation and the moisture-retentive ingredients keep skin hydrated. Justifying its cost: It uses the AQ Cream Meliority, which costs a whopping $1,414 alone, thanks to active Siberian Ginseng and soy extracts. You also get the Emulsion Meliority ($471) with botanical ingredients, the Lotion Meliority ($314) with active herb extracts to moisturise skin, and the Crystal or Lift Comfort Mask ($166) with 16 herbal ingredients to stimulate blood circulation for that victorious glow.